A grimoire recovered by American soldiers during World War One wreaks havoc when it ends up at an Arizona orphanage. France: The Western Front – The Battle of the Argonne Forest – December 2nd, 1918 – German officer Colonel Schneider uses a grimoire and an amulet to conjure Krampus. Schneider’s summoning gets interrupted when American soldiers led by Lt. Patrick McNamara raid the German bunker. Although Patrick recovers Schneider’s items, Patrick and his men end up killed by another squad of German soldiers. Arizona Territory – Three Weeks Later – Jimmy picks up Patrick’s wife, Josephine McNamara, at a train station and takes her to an orphanage to be the new schoolteacher. Sister Mary Rafus runs the orphanage, whose administrators include elderly Sister Martha, alcoholic Father Timothy, and wiccan housemaid Lena. Orphans include Adelia and her friend Henrietta, selfish girl Ida, stutterer Bram, and bullies Jack Larson and Virgil. Adelia shows Henrietta an alchemy book she received from Lena. Ida’s tattling summons Sister Rafus, who confiscates Adelia’s book. Rafus admonishes Lena before greeting Josephine. Sister Rafus breaks up a brawl when Jack and Virgil bully Bram. Adelia and Henrietta take Bram to Lena to dress his wounds. Josephine shares whiskey with Jimmy and Father Timothy. Jack and Virgil later spy on Josephine while she undresses, but Sister Martha frightens them away from Josephine’s door. After morning mass, a soldier arrives at the orphanage to inform Josephine that her husband died in combat. The soldier turns over the items that were in Patrick’s possession. Josephine ends up with the amulet while Ida steals the grimoire. Ida sneaks out of her room to meet her townie boyfriend Billy Miller. Billy becomes frightened when Ida translates the grimoire’s text out loud, causing the book to glow. Krampus manifests and makes both children disappear. Woken by a nightmarish premonition, Lena recovers the grimoire and learns about Krampus. At the same time, a mysterious boy named Nicholas shows up to be taken in as a new orphan. Sister Rafus tries questioning Nicholas the following day. Lena tries warning Rafus about Krampus, but collapses suddenly when Nicholas glares at her. Nicholas has additional odd encounters with Josephine, Sister Martha, and Virgil. Adelia steals back her alchemy book from Sister Rafus’ desk. With help from Henrietta and Bram, Adelia uses the book to find a magical treatment for Lena. Sister Rafus tasks Jimmy to go into town to look for Ida. Jimmy returns with no news regarding the girl’s disappearance. Sister Martha finds Adelia, Henrietta, and Bram reciting an incantation over Lena. Lena suddenly recovers. Sister Martha and Sister Rafus are drawn away when they hear Jack and Virgil screaming in Nicholas’ room. Lena recovers the grimoire as she begins explaining Krampus to Adelia, Henrietta, and Bram. The quartet recites a protection spell that conjures a sphere of energy. Patrick’s spirit warns Josephine that the children are in danger. Josephine comes out of her vision to find Sister Rafus, Sister Martha, and Jimmy murdered. With his dying breath, Father Timothy warns Josephine about a demon from Hell kidnapping the orphans. Josephine confronts Nicholas. Nicholas turns into Krampus in creature form. Krampus explains that Ida freed him from the book where he had been trapped by fairy magic. Krampus reveals his plot to kill, take souls, and trap children. Lena, Adelia, Henrietta, and Bram join Josephine. Lena points out that Krampus cannot harm Josephine since she is wearing the protective amulet. Krampus fires energy bolts from his staff that kill Lena and make Henrietta disappear. Josephine, Adelia, and Bram flee outside with the grimoire. Krampus makes Adelia and Bram vanish while Josephine reads aloud from the book. Josephine’s incantation causes Krampus to magically become trapped inside the book once more. All of the orphans that Krampus took suddenly reappear. Josephine, Adelia, and Bram bury the book. Jack and Virgil reconcile with Bram, who no longer stutters. Josephine gives the amulet to Adelia as they mourn at the graves for Lena and Sister Rafus. Getting all of the DTV Krampus continuities straight can be tricky. Let’s ensure everyone starts on the same page. If it wasn’t already clear, “Krampus Origins” is in no way related to Michael Dougherty’s big-budget “Krampus” movie from Universal. It’s also unconnected to no-budget knockoff “Krampus: The Christmas Devil” and its sequel “Krampus 2: The Devil Returns,” both of which are thoroughly unentertaining abominations of amateur awfulness. Since all three come from writer Robert Conway, “Krampus Origins” more or less ties to Conway’s previous movies “Krampus: The Reckoning” and “Krampus Unleashed.” Except not really. My reviews remind me that “Krampus: The Reckoning” (review here) involved an orphan who conjured Krampus using homemade voodoo dolls. “Krampus Unleashed” (review here) took a different direction by connecting the Christmas creature to an ancient summoning stone Saint Nicholas used to smite sworn enemies. “Krampus Origins” now introduces a German grimoire whose fairy magic binds the yuletide yeti inside its cursed pages. Basically, Conway once again ignores what earlier movies established and restarts from scratch, with Krampus receiving yet another visual facelift as well. 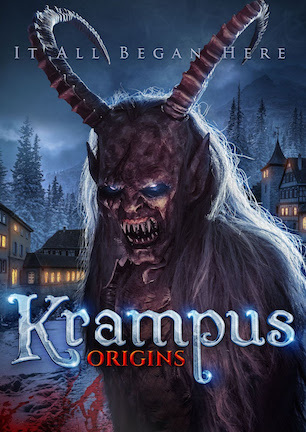 In other words, “Krampus Origins” plays like a standalone prequel to a movie that doesn’t actually exist, as neither the monster nor its mythology remain consistent from one entry to the next in this pseudo-series. Low-grade production value does carry over however. Should you be familiar with the aforementioned movies, then you know what lies in store. Robert Conway relinquishes directorial duties to Joseph Mbah for “Krampus Origins.” Mbah also acts as cinematographer, a role repeated from “Krampus: The Reckoning,” though we do see a slight uptick in image quality this time around. It might not be saying a whole lot, but sets are lit with actual movie lights, the camera takes time to anchor itself to a tripod, and everything appears to be in focus. It’s like applauding water for being wet, but “Krampus Origins” at least addresses some basics by not duplicating the haphazardly careless look of its predecessors. Audio tells another story. I’m not surprised to see only one person cited as the film’s entire ‘Sound Department.’ That same man is also credited as a camera assistant and a gaffer, going a long way toward explaining why it sounds like the microphone was tossed in the air on each take and allowed to record from wherever it happened to land. In the same scene, a character’s dialogue will be muffled for one line and then suddenly echoing off a wall in the next sentence. Inconsistent noise levels are consistently distracting. Not that you’d become immersed in the fiction anyway. “Krampus Origins” takes place in 1918 France for its WWI prologue before moving to Arizona for the remainder. Spartan production design doing its best on a budget has no hope of completely convincing a viewer s/he has traveled through time. One scene dresses a kitchen with period flyers, yet they’re limited to one or two 8.5”x11” sheets on giant white walls. A German military bunker looks like an unfinished building basement. Only 15 or so names are listed as crewmembers and almost all of them have at least two credits. In fairness, they do one of the better jobs I’ve seen for a homebrew friends and family effort considering how few of them they are. Their capabilities are merely outmatched by the script’s ambition. Robert Conway’s story convolutes how Krampus makes his way overseas. American soldiers raiding a bunker on France’s frontline interrupt a German officer in the midst of conjuring Krampus. One of the Americans recovers the officer’s occult tome and accompanying amulet only for the items to change hands again when the soldier’s lieutenant asks for a look. A new crop of Germans then executes everyone. Somehow, the book and amulet still end up sent back to the states among the lieutenant’s possessions. Nice of the Germans to let that looting slide. There are far more fluid ways to get the book to the lieutenant’s widow, who teaches at an Arizona orphanage where curious children eventually enact the summoning ritual. But that’s indicative of how “Krampus Origins” routinely goes out of its way to include many moments of no narrative value. For instance, one sequence has a girl realize she needs a rat’s tail to complete a spell. A boy says he knows where to find one and off they go. The next we see them, they’re back in the same room with their spell underway. I’m at a loss to explain what the movie gains from breaking up the scene that way. A similar setup sees lead nun Sister Rafus tasking her handyman to go into town to look for a missing girl. When he reappears, the handyman simply says he was unable to uncover anything and that’s that. “Krampus Origins” loads itself with numerous nonsensical scenes. I truly believe an instructor could use the film as an example of how not to structure a screenplay, as I can’t imagine what reasoning exists behind such odd inclusions, other than providing padding. Stalling seems to constitute the movie’s general modus operandi. Krampus doesn’t even appear until 60 minutes into an 80-minute runtime. He isn’t remotely worth the wait. Although marginally improved from his previous incarnations, Krampus barely resembles the familiar beast. He wears a centurion helmet that makes him look like a ‘God of War’ boss. With most of his kills occurring offscreen, Krampus’ major moment limits itself to a chatty monologue during which his mouth doesn’t even move. As if the creature being unrecognizable isn’t disappointing enough, “Krampus Origins” doesn’t evoke a holiday season feel either. While the film technically takes place in December and briefly features a tree’s decoration, it’s easy to forget the timeline coincides with Christmas. Oversights additionally diminish the film in its details. Errors range from inconsequential, like an errant apostrophe in opening text making a word possessive instead of plural, to confounding, such as identifying the setting as “Arizona Territory” when Arizona had been a state for six years by 1918. And why on earth does a soldier present the funeral flag to a random nun instead of directly to the widow? Pressed for something positive to point out, acting is average. Performances wouldn’t earn the word “good” in a traditional sense, particularly when incorporating peculiar accents they can’t believably pull off. But most of the actors appear to have some sort of experience or training and are legitimately trying to perform at a community theater level. Or maybe acting appears adequate because the story and overall technical execution are comparably poor. “Krampus Origins” continues the seasonal tradition of putting another loosely Krampus-related lump of coal in indie horror’s stocking. If your naughty list punishment forces you to watch it, at least set your playback speed to 1.5 or 2x. I promise you won’t miss a thing. Then again, you won’t miss anything if you skip “Krampus Origins” entirely either. November 5, 2018 by Ian Sedensky.